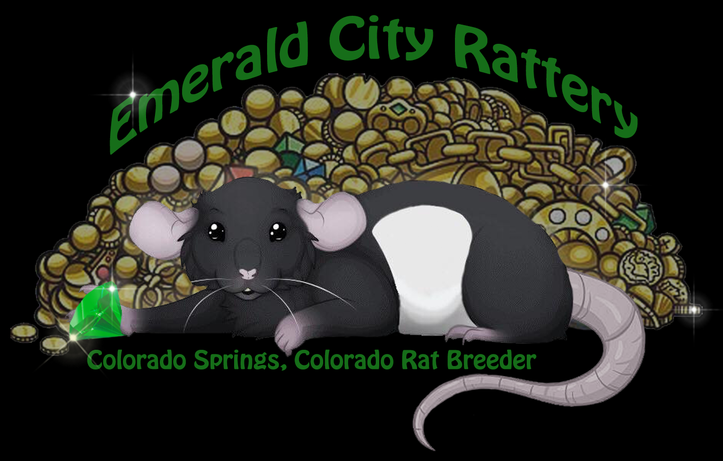 Emerald City Rattery is a very small rattery located in Colorado Springs, Colorado. I only breed 6-10 litters a year with the outcrossing right now I am doing a few more litters than normal. 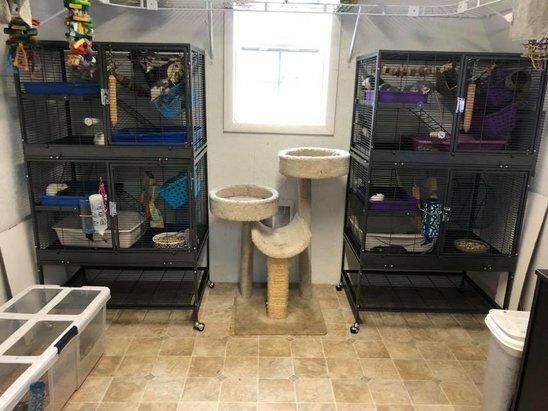 Specializing in Russian Blue, American Blue, Black, Mink, and Agouti with various patterns at the moment but working towards White-Sided, Variegated. Some with Down Under. I also am working on keeping Rex in my marked line and standard coats and hairless in my White-Sided line. This is my rattery setup. 2014 I started my own bloodlines. 2015 I brought in new blood from Camarattery so I will be doing a couple extra breeding's to out cross my bloodlines. 2016 I brought new varieties from Canada. Silvermane, Martens, Marbles, Harleys. 2017 I just spent time outcrossing the Canadian rats that I imported. 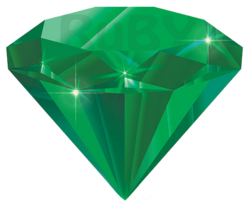 2018 my plan is to just continue working with what I have and outcross the lines for stronger health and temperament. 2019 This year I should have more colors and varieties popping up with the outcrosses from last year. Tags: Colorado Rat Breeder, Colorado Rat Breeders, Colorado Hooded Rat Breeder, Colorado Mink Rat Breeder, Rat Breeder, Capped Rat Breeder, Cinnamon Rat breeder Russian Blue Rat Breeder, Agouti Rat Breeder, Rex Rat Breeder, Hairless Rat Breeder, Hairless Rat, Black Eyed White Rat, Colorado Rat Breeders, Colorado Mink Rat Breeder, Colorado Hooded Rat Breeder, Colorado Hairless Rat Breeder, Colorado Agouti Rat Breeder, Colorado Cinnamon Rat Breeder, Colorado Russian Blue Rat Breeder, Colorado Russian Dove Rat Breeder, Colorado Capped Rat Breeder, Colorado Rex Rat Breeder Colorado Springs Fancy Rat Breeder, Canada Fancy Rat Breeder, Canada Fancy Rat, Canada Fancy Rats, Colorado Springs Fancy Rat, Colorado Fancy Rat Breeder, Colorado Springs Rats, Colorado Springs Fancy Rats, Pet Rats,Marten Rat, Colorado Springs Marten Rat, Harley Rat, Colorado Springs Harley Rat, Harley Rat Breeder, Colorado Springs Marble Rat, Colorado Springs Marble Rat Breeder, Silvermane Rat Breeder, Colorado Springs Silvermane Rat, Colorado Springs Silvermane Rat Breeder.